One of the longest established in Northern California, Skyline Lacrosse Club offers lacrosse to BOYS and GIRLS in grades 2-12 in the East Bay. During the FALL we host clinics and scrimmages in the Oakland/Piedmont area, with practices 1-2 times per week. In the SPRING, we offer developmental instruction for younger players and competitive teams for older players. Practices are from 1-3 times per week with games on the weekends. We compete in the Northern California Junior Lacrosse Association (NCJLA) League, playing teams from Alameda, Contra Costa, Marin, San Francisco, San Mateo and Santa Clara counties. Skyline uses both paid coaches and volunteer parent coaches. Coaches are paid based on lacrosse experience, past coaching experience, and number of years with Skyline Lacrosse. Parent Coaches help as assistant coaches or co-coaches, and/or can be the head coach of a team. This position is unpaid. Skyline guides parent coaches through a training schedule which includes; attendance at the NCJLA Coaching seminars in January, and Level I and Level II online courses provided by US LAX. PCA Seminar attendance is required for all coaches; registration fees are paid by the Club. 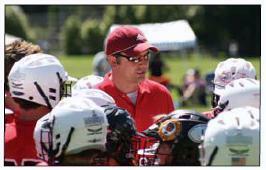 In 2001, US Lacrosse began a partnership with the Stanford University-based Positive Coaching Alliance (PCA). PCA was formed with the goal of changing the culture in youth sports to improve the experience of athletes at all ages, with the mission of "transforming youth sports so sports can transform youth." US Lacrosse and the PCA sponsor the PCA Workshop Grant Program. Get more information on the partnership and the PCA. Background Checks All coaches over the age of 18 years old are required to complete a background check each year they coach. Background checks are administered through the Skyline website during the coaches registration period in partnership with the National Center for Safety Initiatives. US Lacrosse membership, background checks, Level 1 coaching certification, and PCA training is paid for by Skyline. Coaches also receive a copy of the NCJLA Lacrosse Rules and Game Protocols and a copy of the Skyline Coaches Handbook with training information and recommended drill sequences. All coaches are required to register to be a coach. The NCJLA requires that all coaches carry a certified coaches badge during all games. In order to receive a coaches badge you must comply with all requirements listed above, including but not limited to conduct and equipment agreements. Coaches that do not have their certified coaches badge on them during a game will not be allowed on the sidelines with the team.